Some great looking books here! I try to follow the Golden Rule. I think I need a reminder on my mirror that that's what I'm following! This A-Z looks super-organized...y'all always do such a good job. UGH. I messed up on #38 and left something out of my URL...it was early and I was trying to get on the list ASAP! Could you remove #38 when you get a chance? SO excited to be a part of this challenge again. I'm plugging it on my blog today so hopefully I'll send a couple of new people over! Thanks for playing, Alex! I think I LOVE your belief :-) And I feel the same way about speed limit signs! I'll send out some tweets for ya~cheers! Totally in the a to z challenge, man. I'm so psyched! Elizabeth, that's why it's the Golden Rule. Hank, glad you are on board again! Matthew, glad to have you back. Stephanie, that made me chuckle. I'll go fix it. Jamie, thanks for hosting the bloghop - and Amen! I can't believe how quickly the list fills up for the A-Z Challenge. At least I have plenty of time to write and schedule my posts, so I'll have more time for commenting in April. I'm with Elizabeth on the golden rule, although "it will get better' sometimes helps a lot too! Wow! You already have a big list of people signed up for A-Z. I always enjoy reading the posts. Wow. How fast A-Z books up! Neat that there is now a list of like-minded blogs. I'll look forward to some great reading in April. I am staggered how fast the list fills up. I guess I already know what the Kargrandes are. Lots of good new books coming out. Just signed up for the A to Z! I try to live by 3 rules: "First, do no harm"; "think before opening your mouth"; and "worry about it for 15 minutes, then turn it over to God and move on". I'm really excited to read Woven. I've seen a lot of good stuff about it. Against my better judgment, I signed up for the A-to-Z challenge. Now I just need to decide what to do. Thanks for the heads up on Reedsy. What amazes me about A to Z is how that simple idea has grown so much. Not sure I can handle the commitment this year but I'll enjoy reading the posts. So many great books coming out this week! Congrats to everyone! 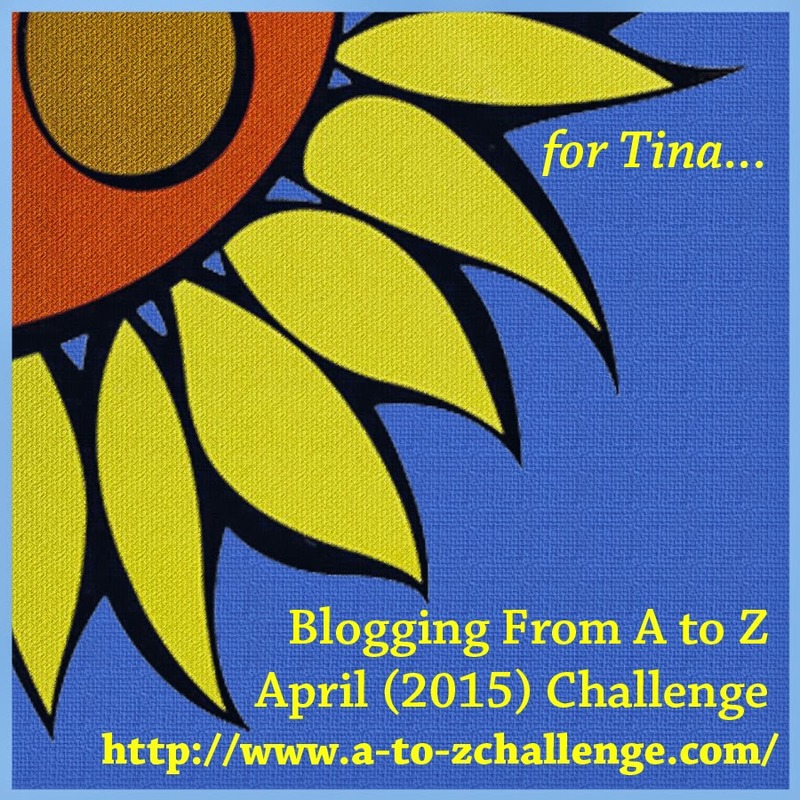 And I love the A to Z Challenge. Didn't get to do it last year, so I'd love to do it this year...I just don't know if I'll be able to. Alright, I'm IN for A to Z in 2015!!! Also, I admire, respect, and also share your shared thought. Sandra, you have two months to plan. Lisa, that is most wise! Keith, hope you can join us then. Donna, and there were only a hundred of us that first year. Kargrandes? Not sure... yet! I have been running around in the background this morning adding my little touches to the A to Z Challenge. Cannot believe it's been a whole year-ish. Gotta have faith, I find we all have to believe in something... if not to believe there is something better. I believe there is something better and sometimes it's right in front of you and you have had it in front of you for as long as you can remember. So glad it's finally here! My brain, unfortunately, goes into the gutter when I read Kargrandes, Alex. I think: Kardashians. So sorry! yikes, can't believe how much is happening here, Alex. Your Dragon of the Stars promos are awesome! I'm excited for A-Z! It's always such a great event! I look forward to supporting A to Z participants this year, but probably won't sign up. I have lots of ideas, but not enough time! I feel like I'm part of secret since I already read Dragon of the Stars. I admit to the same believe about speed limits. Signup numbers are rising fast. Will sure have a look at the other nook. Got on in to the a to z at 42, 24 backwards so works for me. Congrats to all the authors and their books!!! They all sound amazing! Heading over to read what Medeia has to say. Jeremy, believe in something or stand for nothing. Robyn, fortunately it has nothing to do with them! Susan, keep it a secret. And who needs speed limits. So many book releases! Congrats to everyone. I have my A to Z theme but I actually need to start planning my posts. Some of those letters are going to be hard to fill. X? Z? Ugh. Good luck to everyone in the A to Z Challenge. Assuming that I get through all the revising I need to do (on 3 different manuscripts) I plan to take April off from blogging and have my own little NaNo with a Shiny New Idea that's been bugging me. It's already a great day! ALEX!!! Wow. Feeling the alphabet love from every direction! Tina is surely with us! And, she's sending me a blizzard! And please...make more music for us! Wow, you've got a lot going on as usual. That's exciting about A-Z signup being open. I love your thought and your sub-thought. LOL. Good luck to Jamie! I will have to check out this Reedsy blog. Thank you, Alex. Have a great week! I too believe in the one ultimate truth of the universe... that speed limit signs are suggestions. Get out of my way, grandpa! Oh, and I guess that God guy is okay, too. I also believe that there's no way we could ever post once a day without killing ourselves, so we'll leave the A to Z to the pros and merely spectate. I've gone and done it, I've signed up AGAIN for the Challenge. I must be crazy. All the book covers look awesome particularly Evening of the Dragonfly. My beliefs: Jesus Christ is my Lord and Savior. He came down to earth and gave his life for us and our sins. Will tweet your clues later today and read about Medeia. Great list of books out this week. Curious about your novel, Alex. And I'm tempted with the A-Z. My problem is I have plans in April. Need to think about it. Wouldn't want to let anyone down. Sarah, you'll think of something. Heather! Tina will always be with us. Brandon and Bryan, that made me chuckle. And what is with slow drivers? Bish, you know you can't resist. LG, you should. Be nice to have you back with is. Alex, I love your belief! This week's books look great. Happy to see Woven hit the shelves. I just love the cover. I am not curious, I am super, super curious about the Kargrandes. Merely a suggestion, eh? Funny. From a mother's perspective: Bad Alex--Bad Alex! The more I hear about the kargrandes, the more I am intrigued. Lots of good stuff getting put out by talented writers like yourself. Boy, A to Z is already back? I can't believe how fast a year goes by these days. I will be checking out Medeia and David's posts. Yay for the new books coming out! My hubby believes speed signs are merely suggestions too. Although, in the winter time, he listens to them more closely. You have quite an amazing list of talent for the next few weeks. I can't say enough about getting out the word about new books. My publisher messed up (using nice words here) last fall when Mage Revealed came out. I had a whole week before release to get the word out not several months or weeks. The Golden Rule has always been a guidepost for me. I'm aiming for 2016 for the A-Z, simply because I don't want to get distracted from my main writing goal right now. My plate is FULL! But being female, I reserve the right to change my mind! I see you're on your way with your new book. Good job. Tweeted. The list is growing! Congrats to those with new books out. Signed up! I love that we are tributing Tina this year. Now I need to think up a theme that she would be proud of. I'm looking forward to finding out more about the kargrandes. Joylene, I am filled with shame. Not! Patricia, in wintertime, I'm more concerned about everyone else. Carol, I'm sorry! I'm glad my publisher sets dates months in advance. And lets me know. Fundy, feel free to change it. Sorry missed your guitar playing last week but just listened, LOVE IT. Best of sales with all the new books! Reedsy looks like a good site. Anyone publishing needs to band together. Signed up already to A-Z! And I know my idea, so that's something. Glad to see the A to Z signups are coming along just fine! And good luck to everyone with their upcoming releases! I don't know what a Kargrandes is, but it sounds delicious! Signed up for A-Z. Crazy that it's coming up again. I will check out Reedsy for sure. Thanks for the heads up. And thinks for the Reedsy link. Will have to check it and your post out. Some great things happening with blogger buds, including the release of Woven, which is wonderful and written for fantasy enjoyment. I just cannot resist the A to Z! The sign-up list is moving along really quickly. Can't believe this will be my 5th challenge! I love your thoughts... amen! Thanks for the shout out, Alex. I'm looking forward to the A to Z challenge and visiting your blog next week. As for your belief you shared...I agree whole heartedly. It amazed me how the numbers are building! I've read WOVEN and I'm excited for David's debut release! I know I cave every year, but I think this year I'm staying out of the A to Z challenge for real. I mean it. Yep. Some great looking books coming out! I will not be doing A to Z. Maybe someday, but it's not something I can commit to now. I admire those who do it, though! the "18 defining thoughts" was a good time for reflection. I will post my thoughts tomorrow, 1/27. Is January really ending? Already? I am impressed at how fast that list grows. The dwarves think the Kargrandes are a Formula 1 Team, I think they are a race. Yes, I am registered for the upcoming A-Z! I have just registered and looking forward to it. Enjoyed your interview at Reedsy! Look at all those A-Zers! Wow! I always love reading the posts and seeing the themes. I try to follow the Golden Rule. If we all treated people the way we wanted to be treated I think the world would be a better place. Wow! Lots of challengers are signed up already. I don't know if I'm going to do it this year. I know I'll be out of town for a week in April, so I'd have to get 7 posts up before I go. We'll see. I'll go check out the new blog you mentioned. Your A-Z Challenge is certainly a success and countless people obviously benefit from it. Congratulations to you. Y'all have fun with the A-Z! Echoing Carol on the Karagrandes. Congratulations to all the authors. I hope their books do really, really well. And admiration for all the A to Zers. Much more discipline than I can muster. Suzanne, First Corinthians came to me as well. Jay, no! Don't eat them. Charity, you're welcome, and Amen. Cold, I would be stunned if it was! Al, no worries! The thought counts. Leovi, that's how we met in the first place. Congratulations to all the authors with new releases. I'm not sure if I'll do A-Z this year. I believe in treating others as you wish to be treated. Have a great week! I'm not doing the A-Z but it's always fun! Medeia always writes interesting articles. Just joined A-Z. Participated several years ago and now I'm back in the saddle again. Hoping over to Readsy now. There are so many books I want to read. I just tweeted about yours--it's hard for me to spell that K word on my own without copying and pasting. As it turns out, I am bypassing A-Z this year. Just visited Reedsy. Great interview. The belief that changed my life is the same one you shared. There's some great books coming out, and I'll be checking out Medeia's post on Wednesday. Awesome thoughts! I'm still think about the A to Z this year because my life is very chaotic. I'm eager to check out the other entries though. Donna, glad you're on board. Medeia, I know! There's a reason I chose that name though. Michael, glad you're joining us! Yep, I had missed the clip, so thanks for linking it to this post. Once again, I'm gobsmacked by the sheer talent of bloggers judging by the releases! Thanks for the Reedsey heads up. What a great idea for self published authors! Sorry, not playing the K adventure as I frequently forget to blog. I like the categories list for the A-Z, and if I ever decide to participate instead of take a blog break, mine would likely be under storytelling/writing. I might visit a few of the participating blogs though to find new places/people to visit. There are always books on your posts that I want! As for the Kargrandes--sadly, I always need a lot of clues to figure something out. I'm hopping over to see you at Reedsy. Being self-published, I'm happy to get all the help I can muster. Looks like my comment got eaten. Although I don't think I said much other than this is the first time I've signed up this early for A to Z. Some beautiful covers up there and a few of the stories capture my interest. Must check them out. I think your one belief is perfect. I feel the same--even about speed signs, lol! A-Z I want to join but I already know I simply can't keep up with daily posts right now. I'm trying to talk to Kat about sharing the task. She's in the middle of a new book, but if she can't join in I'll do my quasi 3 posts a week with the corresponding letter. Plus, I do visit as many blogs as I can. I'm still thinking about it all and maybe a way to have some guests do a letter themed post. I feel the same way about speed limit signs, with obvious exceptions like not doing 100 mph through a residential neighborhood or 20 on the freeway. I wish cops would find something better to do than try to trap people going over the speed limit. I've got nine posts written for A to Z on my main blog, but haven't started putting my theme together for my names blog. I've got a theme in mind, but need to see how many letters I can match to names for it, and then plan for potential wildcard days. I love what you're doing with the 'What are the Kargrandes' website! And I'm with you on the one belief. Totally. Can't believe it's almost time for another A to Z Challenge! Congrats to those with books out. They all have great covers. I love your belief, it's perfect. Good luck with the A to Z Challenge. It's always fun to follow. Every year I tell myself I will do the A-Z, and every year I don't do the A-Z. It's almost like I procrastinate at blogging just as much as at writing. I have a great (stupid) A-Z based poem too, but that's, um, one post. Only 25 more to think of. Hrm. Looks like a big week with all those book releases and the AtoZ sign up. Glad to see it is dedicated to Tina. Denise, it's a great resource. Donna, you know I'll be featuring new bloggers. Liz, sorry, but glad you are near the top of the list! Sia, Amen! And hope you can join us, but don't overstretch. Carrie-Anne, glad you're planning ahead. Back in the swing of things from my extended holiday break. I hope you enjoyed the festive season, too! Just added my name to A-Z and Jeremy if you want my help again this year, I would be happy to oblige. I meant to leave that thunderclap comment on someone else's blog . . .sorry, Alex. Too many windows open at once causes confusion, especially in someone who's already easily confused anyway. Anyway, just sent out another tweet for ya--so exciting! Hokey smokes, looks like April is going to be fun! I'm glad you specified that for the a-z you had to have an open platform. I don't know if it has always been like that, but that great. I see 'manys a people' have already signed up! I'll be tweeting and sharing as soon as I get a chance. Hugs! Tyrean just keeps on writing! Keep on truckin'! Going to be reckless and do A to Z again, but with a different theme, of course. 1. What are the Kargrandes? It's killing me...I hate not knowing things. Are they scales? Eggs? or Dragon hygienists? 2. I'm super excited for DPK and his book Woven. ha. i will let the cop know, next time i am pulled over, that i was told they were just suggestions....smiles. nice statement of faith, we are not that much different...smiles. Yipes, A to Z is getting HUGE! I will be participating through Untethered Realms. Should be fun! Thanks for the infoblog, I will be sure to jump over there. I really have to think about A-Z this year. I did enjoy it last year. Will be checking out Reedsy a bit later today. A-Z might be a pass for me this year. Enjoyed it last year but the novels are first priority this year. Carolyn, welcome back! I'm sure Jeremy will be grateful for you help. Rosey, awesome! And it blows my mind how fast cars can zoom through a residential area. Holly, we had issues with closed platforms and Facebook last year. Eva, you had to! And hope you enjoy the first book. Roland, you can't say no. Erin, thanks for the laugh this morning!! T, you could always go with no categroy. That's me all signed up, wouldn't miss it! 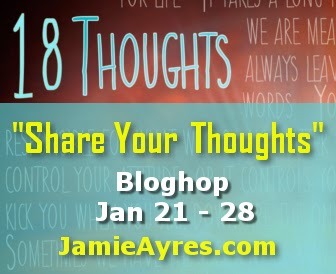 Interesting this Share Your Thoughts Bloghop!! Every time you post a bunch of new book covers, I add books to my TBR list. I cannot possibly live long enough to read them all. But thank you, anyway, Alex. You do your readers a great service with these book promos. A to Z time already? i know time speeds up as you get older, but holy moley it's flying by. Wow - lots of participants for the A to Z challenge! I probably won't do it this way, but hope everyone has fun with it! I just signed up for A to Z! Already feeling better because I have a theme this year! I really want to read Woven. Thank you very much, it is a pleasure to visit your blog! I wish you a good day. Reedsy sound great! I'm sure it's quite helpful to many. Have to spread the word. #sighs ... the A to Z Challenge ... This will be the first year I will not participate. I LUV doing it, but life has too many obstacles in my way right now to do it justice. I also need to hunker down and start, work on, and complete my next book. I can't wait to read all the posts, though! Looking forward to reading about the kargrandes. Will be taking part of AtoZ through Untethered Realms. Susanne, you will be busy. Wow, that sign-up list for the A-Z Challenge is enormous!! I'm not going to do it this year, but I'll be cheering all of you on! Yeah! It's so early for the A to Z Challenge and you've already got three hundred and sixty five people signed up! Incredible! So many new releases. Best of luck to one and all. I am in total agreement with your belief statement. Um, make that both of them. Loved your post on Reedsy! I've heard cool things about that site (mostly from Elizabeth Craig). Hi Alex! I am trying to visit all the co-hosts in the next couple of weeks. Visited Heather first and thanked her for some strategic tweets, then Jeremy, and thanked him for the art. I think I am actually in the ISW, if I haven't been cleaned out for lack of engagement or whatever. Joined it about a year ago because I was trying to figure out if the ISW Alex was Captain Alex of the Ninja Army. Seriously, thanks for keeping the A to Z going. It is a beautiful thing! I'm going to have to delve into the mystery that is the Kargrandes....hmmm. Sounds interesting. Holy.Cow. Can't believe A-Z is here already!!! These years go by so fast. I'm planning to sign up, but my brain is cluttered right now, so I'll wait until I can defrag and pay attention to the rules. Kim, not a chance they are related. Gene, welcome! A pirate crew is just as cool. How cool that you have a website dedicated to the mystery of the Kargrandes - what a fun way to build anticipation for a book! We love to see you jam anytime Alex. Reedsy sounds like a good site. So happy for David with Woven. Mike too. You share so much with us Alex, I can't thank you enough. Sorry no A-Z for me this year. Wow wow wow, A to Z is starting again! Excited :) Always a fun month in the blogging community. No way I could do a post-every-day thing in April... I don't even know where I'm going to be in April. >_< But I hope it goes well for everyone participating, sounds chaotic but fun. And yes, not only are speed limits mere suggestions, but here in Albuquerque, turn signals are too. So are traffic lanes, sometimes. Oi. Great thought:) The speed limit one made me giggle. I must wholeheartedly agree that speed limit signs are just a suggestion. Look at how many A-to-Z signups there are already! Funny story: I am in the ISW, but not active. I would not blame you if you booted me. Visiting all the co-hosts before the April madness starts. And thank you so much for visiting me first! Gene, if you want to stay in the group, post next week. Otherwise, yeah, you might get culled. And in addition to the Ninja Army, I also have clones. They come in handy. So many great new books coming out all the time. How can one keep up? I loved your Reedsy interview, and I see there are 3 puzzle pieces of your cover now. Kargrandes sound very cool, like the worms in Dune. I enjoyed Medeia's post on the IWSG site. Congrats to Tyrean, Charity, David, Lisa-Buie, Mary, and Cate! Thanks so much for all the updates. Looks like A to Z is going to have a banner year! Alex!!!!! Hi there :) Sorry it's taken me so long to come around. I see you're still hard at work promoting the world. You're such an all around great person. I'll be around more now that I've shed the life-sucking job. Hope all is going well with you and yours! Randi Lee! Thanks and always good to hear from you. Speed limit signs are definitely just suggestions. Good luck to everyone taking part in the A-Z this year. I like the badge design. My belief is that everything happens for a reason, even if you can't appreciate it at the time. Wow, the A to Z is coming up again. I'm tired already! hehe. But of course I must sign up! Thanks for the Reedsy suggestion. That sounds like just what I will need when I get to the point of self publication. The A to Z challenge is always fun to watch for me. Maybe one year I'll actually participate. The new releases look good. I was hopeing to win a copy of Woven, but oh well. I'm happy for you that feels so secure in their beliefs, Thanks for sharing! The new A to Z badge is beautiful. I haven't made up my mind, yet, about the challenge. The A to Z is going strong (YEAH). I was out last year and probably this year. I have so many projects going on with my writing. I agree with you, Alex. The One True God and His Son Lord Yeshua reign Supreme. (Hmm. I've been known to break a few speed limits myself.) I also believe that anyone can do anything if they work hard at it. I'm tweeting for you, Captain. P.S. I HAVE to have David's book. That cover is totally bodacious! Holy Moses! I've been thinking of the A-Z this year (previous years have filled up) and when I saw your headline, said, "I'll just wait and see if I can." Heck! That list is already a mile long! Haha. Good! I might just go ahead and add my name; if things change, I'll let you know. I have a pretty simple idea. I'm anxious to know the reveal of the Kargrandes! And cheers to DPK and MJ!